Winter is festival season in many mid-Atlantic small towns. Go outside and play. 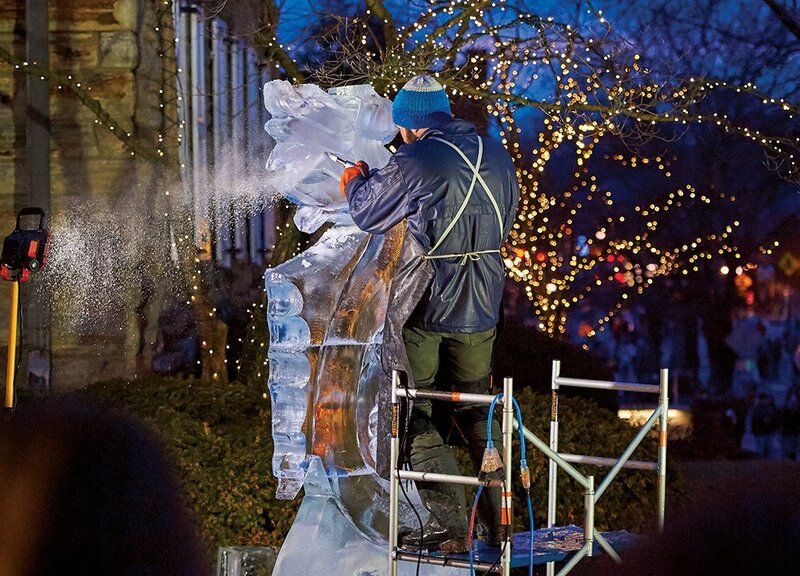 An ice sculptor at the annual Fire and Ice Festival in Lititz, Pennsylvania. Photo by Amy Spangler. If you’re suffering from a nagging bout of cabin fever, you might want to bundle up and venture out into the land of fire and ice. I’m not talking about Iceland (which goes by that moniker) or Westeros, the mythical realm in Game of Thrones. I’m referring to the many small towns, mostly north of Washington, D.C., that welcome winter visitors to their annual “fire and ice” festivals. 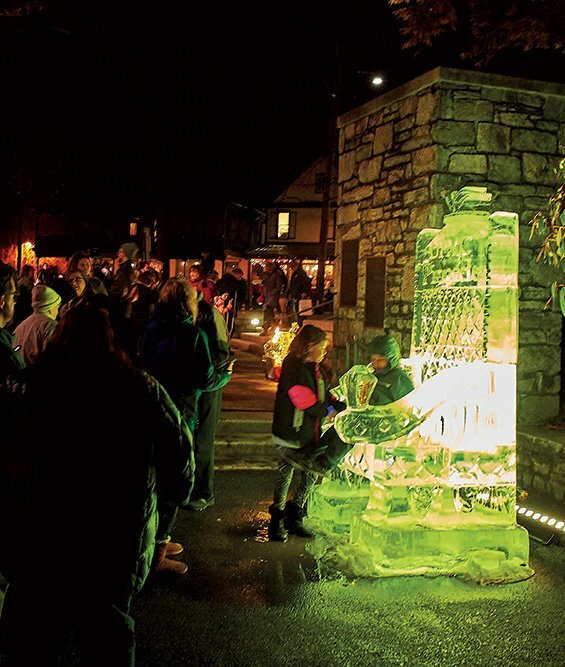 You’ll find beautifully carved ice sculptures and various opportunities to eat, drink and play with fire—including chili contests, fire dancers, bonfires and marshmallow roasts. An interactive ice throne. Photo by Amy Spangler. This past February, I headed to Lititz, Pennsylvania (about 120 miles north of Bethesda, near Lancaster), to meet my friend Carol and check out the town’s 13th annual Fire and Ice Festival. (The 2019 festival will take place Feb. 15-18; lititzfireandice.com.) Founded in 1742 by Count Nicholas Ludwig von Zinzendorf, who was seeking religious freedom for his Moravian community, Lititz—population just over 9,000—was named “America’s Coolest Small Town” by Budget Travel in 2013. It’s a picturesque place, tucked into rolling countryside with an attractive mix of historic Federal-style and gray limestone buildings, along with a few towering steeples defining its skyline. Walking down Main Street, we come across a thigh-high ice pretzel outside the Julius Sturgis Pretzel Bakery. Local businesses hoping to capitalize on the estimated 40,000 festival visitors, we’re told, sponsor their own ice sculptures, usually with a theme related to their specialty. In our case it works. We pop inside the bakery and, for a small fee, take a tour and learn how to twist pretzels correctly at what was reportedly the first commercial pretzel bakery in the U.S., where workers once made 10 cents an hour, working 10 hours a day, six days a week. Our salty carb indulgence is to be the first of many. 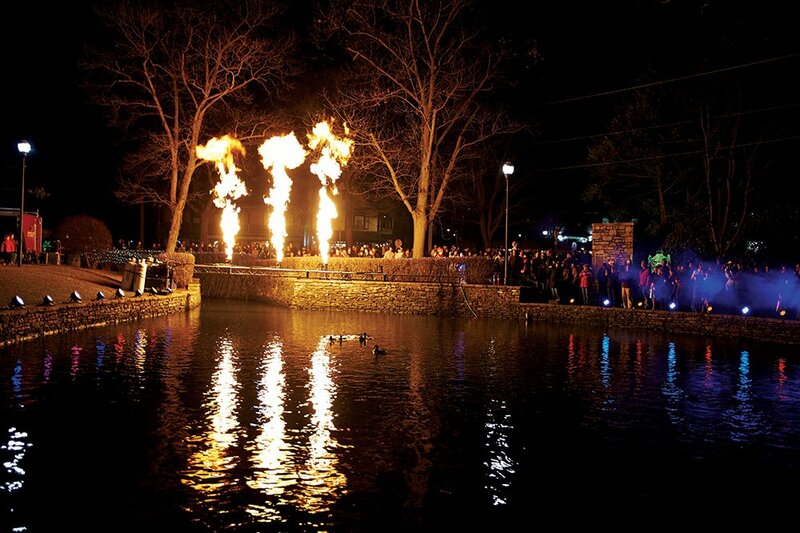 A pyrotechnic display in Lititz. Photo by Amy Spangler. To kick off the official festivities, Lititz shuts down its central streets and has a block party on Friday night. The biggest spectacles are more than 50 ice sculptures, ranging from a massive throne (yes, you can sit on it) to delightful smaller pieces depicting food, animals (both real and fantastical) and symbols. Many are backlit with colored lights.